Sassnitz is no longer an only industrial town, it has been an attractive tourist place. 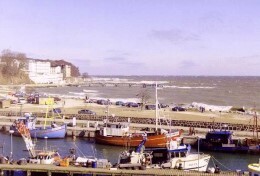 Who is one time in Sassnitz must watch the harbour with its 1450 metres long mole and its fishing trawlers. The restaurants, cafés and the museum of fishing industry and harbour invite you for staying. 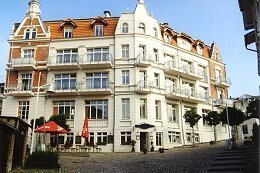 The second part of the town, which you shouldn't let slip, is the old-town of Sassnitz. This one is only a few metres away from the harbour. Today the old-town is a mixture between lovely restaurated, old, restore-using and partly new buildings, which are connected together with tortuous little alleys and stairs. The town Sassnitz is the door to the national park "Jasmund" which you can roam on foot or by bike. Only a few kilometres away from Sassnitz you will find the most beautiful beaches of the isle Rügen.